Many corporate organisations like to use floral arrangements as a way to enhance their offices and welcome visitors with beautiful visuals and soothing ambiences. Marketing directly to corporate organisations is a smart move for florists as this type of business relationship often includes many standing orders, a great deal of repeat work and the promise of recommendations to other potential customers. But florists who target corporate organisations must understand the unique needs of this segment. Florists should be ready to discuss corporate floral needs as well as create floral arrangements specifically for reception areas, not to mention have a general understanding of appropriate arrangements when personal orders are placed for delivery to corporate settings. Many corporate organisations which require regular floral orders will know exactly what is needed and may ask florists to tender for this work, but there are always other organisations which will know that they have floral needs but not know that these needs may be. When working with the latter type of clients, florists would do well to have a portfolio of examples ready. Larger flower arrangements for reception areas, small flower arrangements for office areas and plants and trees that can be easily tended throughout the building are all common options for corporate environments. Depending upon the organisation, actual flower gardens for both interior and exterior areas may also be desired. In addition to showing potential clients examples of their work, florists should also be ready to discuss their prices, their availability for standing orders and their policies on substitutions should desired items be unavailable. Florists will also want to mention their ability to provide arrangements for the organisation's clients as well, particularly for the holiday periods. Floral arrangements for receptions areas will be seen by everyone entering a particular office suite, including employees and clients. This means that these arrangements must be tasteful and in keeping with the ethos and tone of the organisation. Florists who enjoy creating unique arrangements on a regular basis should use this as a unique selling point to corporate clients, but should not be surprised if clients simply create a standing order for the same type of arrangement or even order on a price basis only. Whether or not they supply corporate organisations, most florists will at some time or another find themselves asked to deliver arrangements to individuals who work in corporate environments. While some customers will know exactly what they want to send, florists may need to guide others towards appropriate arrangements for this setting. Advising customers to choose tasteful and traditional arrangements, to stay away from ordering an excessive number of blooms, to refrain from sending flowers with heavy scents and to keep messages appropriate for an office environment are all hints that come in handy for these orders. 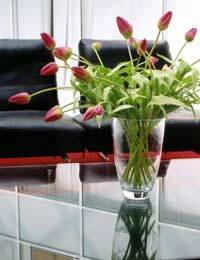 Many florists enjoy supplying floral arrangements for corporate offices. This type of business can be quite lucrative and consistent, but florists should recognise that their discretion and professionalism is usually required by corporate clients. Remaining ready to discuss corporate floral needs, provide floral arrangements for dedicated reception areas and guide customers towards personal arrangements appropriate for corporate settings are all things that florists should be able to provide if they are interested in supplying corporate clients.